The electric which goes off often these has gone immense without a limit and extends beyond the scheduled times has become a challenge for everybody and the worst thing was as it goes away at mid-day when heat waves fold away. People believed the new government will solve this problem as soon it take oath, but whoever forms the govt. could not do anything unless wind blows, rain stores the reservoirs or plants produce high electric. Its sorrow to see people suffer from power outage and its wonder how some act like that only now it’s getting hot and experiencing a summer for the first time that heading out home or the a/c room will burn into ashes. I’m not against people getting comfort from a/c rooms and getting cool themselves from summer heat but speaking without sense struck me hard as if they are the only survivors in this universe and those works for sum under the scorching sun will do with no option to survive. Ok. Come to the post, it’s a dream come true for me after days or years of waiting for a best sound system that could content my heart listening to music and watching movies. It’s more than a decade I went to an enclosed theater where sound quality would be best at experiencing a quite movie but being a regular visitor to a Drive-In theater was not that greater to say about sound except good viewing at our leisure. I always believe Sony is the best for music and so brought a home theater with lot of expectation that could meet my LED TV and satisfy me in various forms in which getting a best sound system and easy to control which has never become balanced so far. The new DVD Home Theater (DAV-TZ210) was the least cheap and best product from the Sony connects almost all digital devices which response in high definition and controls all connectivity in one remote. I’m overjoyed by the product and listening to my favorite music and songs sounds so good and best at tempo and clear bass discovers many hidden species so far appears nothing and I haven’t checked with movies yet the installation has not done, the system is waiting for the company guys to demo and arrange the speakers. I connected few speakers and woofer with the help of mum and wonder how would it sound if surround speakers installed at its position. Awe... I am so happy with it and enjoying one of my passions for music and cinema. 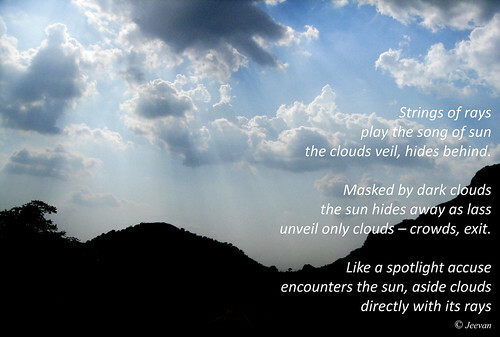 Wrote this poem inspired by the stunning rays, I captured while nearly Bangalore lately. standing behind me, lifting above. I just don’t want to think a lot to make it more impressive, I just write what I feel this moment. 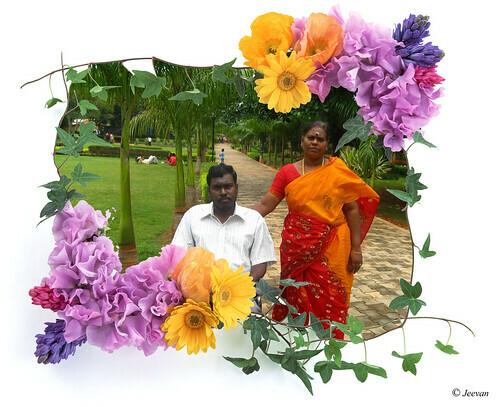 Today is my Mother’s Birthday, so I wish her all the best and good health... forever to be strong. There’s another sweetheart born this day is our friend Keshi. I could not forget her Birthday easily as there no need a reason to say. Wish u very Happy B’day Keshi. unless air loses in tier. the entire lifecycle of human. the environment at better position. My blog has grown six years old and I still write with same enthusiasm and whole hearty and have come across a lot of people who in turn continue to follow me as a reader, friend and many who left the blogosphere but still continue to support me as a silent reader has brought many changes into my life and I have learned a lot through there blogs and visits that encouraged me to withstand the strain I go through life has perhaps shaped me as a person to work with more confident and sustain here thus far. Today many social networks and forms have come but like blogging nothing gives me content feeling and doing something worth to keep myself occupied and sharing my thoughts, experience and feeling with others. I just believe that best is yet to come even I am content with things happening and this attitude makes me progress and inspires to write more on places I explore and explain my thoughts and deeds in detail. I take this chance to thank you all for being beside me, encouraging and supporting from overseas and I am still blogging is because of you, whose comments and messages convey me your direct support which influences a lot in leading my blog. I not alone thank you, because this two little words is not enough really to show my gratitude whose kindness and attitude in accepting the variants in thoughts and sense are not an easy thing to appreciate but accepting the truth is what I appreciate about blogs and being reliable to either is the source of this blogging. Whatever I say, sometimes I write for myself. It’s the pressure that I need to release somewhere and things I can’t accept being abnormal and incredible against the sense and passion that derives me not to leave this space created for me to voice in society and access communication with others. 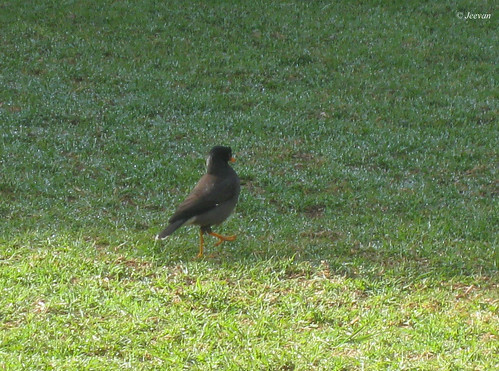 There are networks like Facebook, Orkut, and Twitter… but nothing satisfied me like writing a blog. Yours truly! There’s no age to play things and it depend on mind completely and such things happen sometime seeing someone playing with something. I wish to play always and never feel I am growing except my thoughts and no one complain about it since mostly everyone treats me at home and families as a kid and I agree with it and only sense and knowledge have grown and physically I’m in a child’s stage. I was at HAL Aerospace Museum in Bangalore recently checking the amazing old and renovated aircrafts at display and at the end of our walkabout inside the museum; we enter the main building to find out something and got to know about this remote control helicopter. 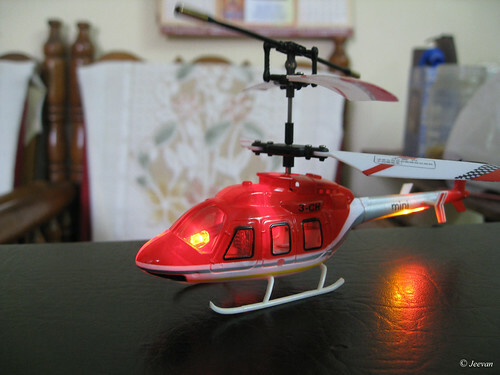 First I wasn’t liked as I was looking out for RC Car, knowing my cousin’s interest and the helicopter takeoff really I want to go for it and it was wonderful from then to see it flying and operating was very fun and enthusiastic. The moon in the picture was taken on Super-moon day couple of months back. 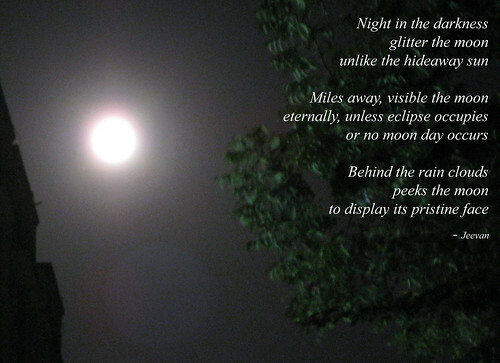 The Haiku was inspired by the Lunar eclipse i missed to check yesterday. Wow… it was a super cool evening at last amid hot weather, the rain that last couple of hours yesterday reduces the temperature partially, leaps out frogs and mosquitoes outside the home and water stagnant on roads. I was just refreshing in the drops of rain at doorstep and the fragrance of soil that stimulates in touch of fresh raindrops and the wind that blows off pretty warm and later cool. The day not alone end the hot weather was also off to summer holidays due to schools reopen today after two months holiday which extended by a week and so by the confusion behind bring the Samacheer Kalvi (Uniform System of School Education) for 1 to 10 std from this current year which brought by the latter government to give parallel education to everyone in the state opposed by the new govt. is in supreme court to seek justice as their favor to reestablish the syllabus from next year. As per court order an expert committee has to be formed to clear it in three week, but schools reopened today what kind of lessons the 3 weeks going to teach the children has been put pause along with confusion which going to bring an extreme pressure esp. for the 10th std students who faces the public exam . This is a wonderful opportunity I think for schools to educate children about life and activities that bring out their creativity and moral sense which has to be developed and follow along their syllabus. It’s obvious that there is a political game behind it and whatever it might be, when it comes to social interest and important, beyond ego, selfish and personal rages the significant has to be forced immediately. It’s quite foolish decision taken by the govt. to stop the uniform education system after a whole lot of books have been printed and yet to distribute, it doesn’t looks like public favor. The situation of opening schools from the actual date has never been too late like this and it could make children happy to go to school just to play and have fun with friends but the real pressure beyond their happiness is in cope with lessons. I wonder why such things never happened in our life, so that we could have enjoyed going to school just to go play and have fun except nothing to study. Hehe… The cousin who has been along with me almost the whole summer vacation has left now with a lack of space of entertainment and support, it was wonderful learning many things from this vacation and traveling and it seems true that only we get closer we understand a lot about others, for good as well as to avoid certain things to continue a smooth relationship. 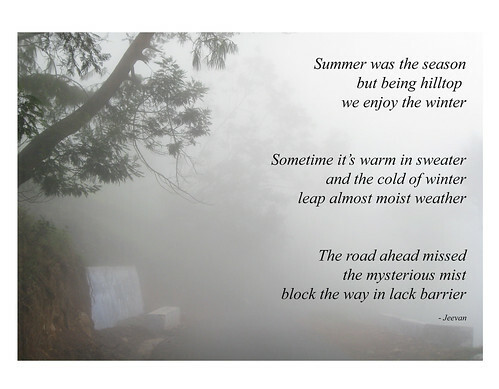 Just thought to write something and tried Haiku style of poem, inspired by the cool mist. 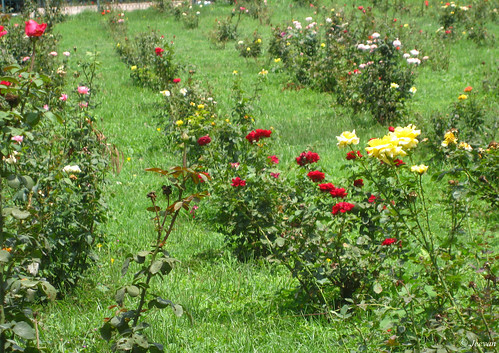 The city elevated from nearly thousand meters above sea level has very pleasant weather to stay among cities and even the sun beats down, the cool wind blows off the trees in and around the garden-city maintain the temperate but the critical and worst part was traveling within its boundary. No one stops the vehicle for any reason unless forced to stop it and it’s a challenge to outsiders to drive into the city and tough moving without guidance, it seems like conducting a race among the residence is easy and thus how rashes they drives. I know I know… Bangalore isn’t an only city to experience the worst traveling and many metropolitans perhaps more or less produce a similar challenge for riders but compare to Chennaites, Bangaloreans are fast moving and whatever the means of source it showdowns the worthiness of life and things. 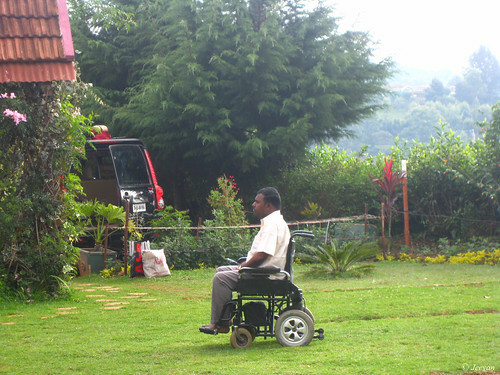 Leaving away the nonstop challenge on roads in Bangalore and any other cities in India, it was very pleasant staying at a friend’s place in their care and comfort and guidance. Karthik’s mom who invited us to her home in Bangalore take care our complete stuff single handedly and arranged for a guided tour into the city, which helped us in checking out the Cubbon Park, Visvesvaraya Industrial and Technological Museum, HAL Aerospace Museum, Ulsoor Lake and Lal Bagh. 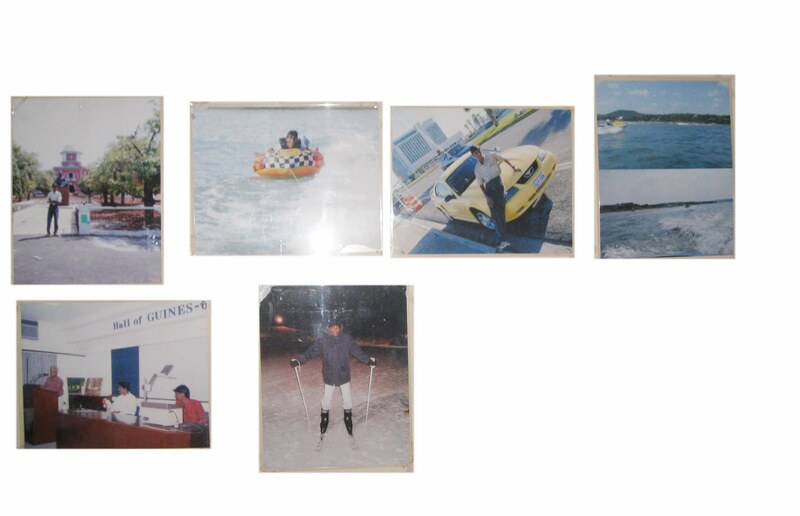 To say about the places visited, everything has something interesting and worth visiting esp. 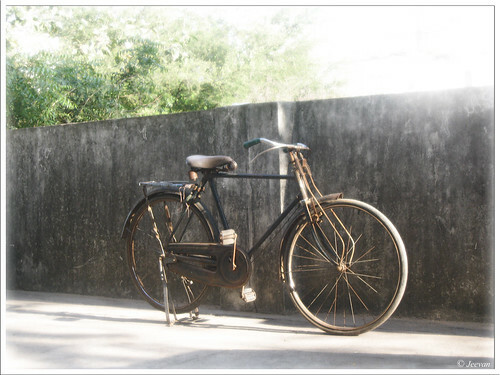 the Visvesvaraya and HAL museums are remarkable by its facts and figures at display and operating each simple mechanism and instrument was fun. 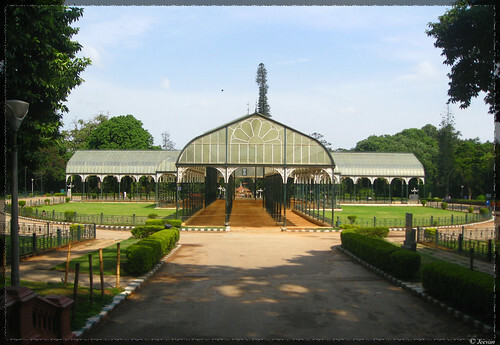 To say the most beautiful thing about Bangalore was the Lal Bagh, which brings the garden city feel within its premises unlike Cubbon Park which is parted by inner roads used by public vehicles. We stayed at Karthik’s home in National Games Village, Koramangala, which he bought before his depart and now his mother takes care of the things along with his memories and she never fails to visit his home ones in a month and she feels completely with his son the times being there and it’s the only solace and depression she bears in life. 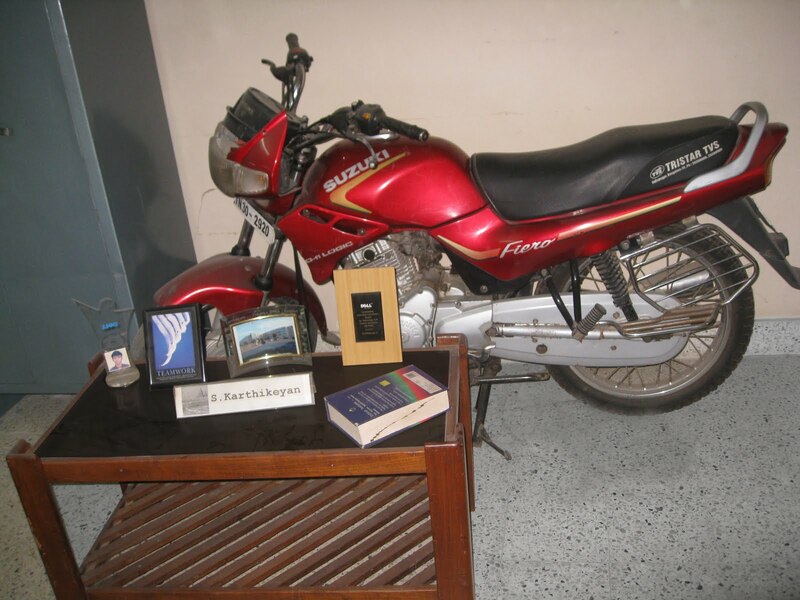 All over her home it was Karthik’s photos and she arranged his things and awards in the hall along with his bike he used at last. Apart constant and carelessly driving fast, few are people friendly and helpful knowing we are from other state by indentifying our car number guide us at few places and on other day when we are on our way to Nandi Hills, a man in his middle-age drives beside us in his Maruti 800 until we take diversion to Nandi hills and his advice to maintain less than 80kmph helped us from getting fined. It was very difficult to find route on our own in Bangalore which hold partially Tamil speaking people and even they know Tamil they are avoiding to speak – may be they hesitate that it will affect their living. We could see many luxury cars used as taxies in Bangalore alike in foreign countries and it was wonderful seeing Bangalore leading a international living in country and thus could be the reason everyone movies very fast in making money and lack giving due attention to others while driving and just moves fast even dash with other or make accident with lives. We witnessed two incident where both were taken casually and moves faster even someone bleeds. I wonder what a life they are living, keeping their everyday life as a bet to survive with money. I’m not complaining but just say what I think about.